I usually prefer reading an autobiography rather than a biography - there's just so much more "feeling" and personal facts communicated in the former. However, Neil Diamond is a world famous class act, having written so many memorable songs that I thought I would give this book a go. Songs such as "Cracklin' Rosie", "Sweet Caroline", "You Don't Bring Me Flowers", "I'm A Believer", "Red Red Wine", "Solitary Man', and "America" to name but a few. Mr. Diamond's career spans over forty years and with a series of concerts and performances seemingly always scheduled, he doesn't seem to be on the decline. From Brooklyn, New York, he started out writing poems and decided, shy as he was, that songwriting (and later performing) followed naturally. It was a struggle in the beginning before he wrote songs that made it to the charts but before long, he was heading to the west coast where he stayed. Unfortunately this new career came at a high price as he and his first wife (two daughters) got divorced. Nearly twenty-five years with his beloved second wife Marcia, also came to a halt. 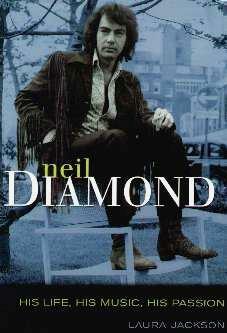 Neil Diamond is also known for having one of the most costly divorces in the world. His hectic life of being on the road, the solitary existence necessary for so many writers, took its toll on his personal life. This book has so much detail about his chart hits and misses, and tour venues, and not nearly enough about his family, or even his bike ride across the country, or personal thoughts which would make for a much more interesting read. It took me longer than was necessary to get through this bunch of stats as I had to keep re-reading sentences. Rather like a lot of written articles cobbled together. Maybe I just wasn't in the mood when reading this. Conclusion - Interesting enough but a little monotonous.